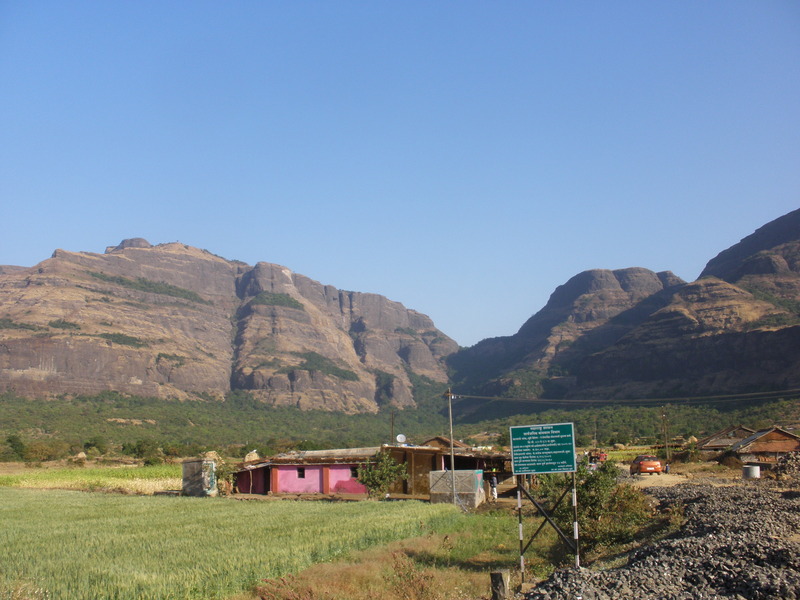 via Khireshwar village – Take the 5am bus to Ahmednagar from Kalyan via Malshej ghat and get down at Khubi phata. From here the Khireshwar is a 4km walk [45 mins]. As Khubi phata is not a scheduled bus stop chances of getting a trax / jeep to the base village are remote. One can get down at the scheduled stop just after crossing Khubi phata and take a trax / jeep to Khubi phata. The way to Khireshwar goes along the Pimpalgaon Jog dam. At the base village one can park their vehicles and also have breakfast before commnecing the climb. The climb is spilt up into three patches. The first patch is the gradual climb from the base village to Tolar Khind. The second patch is negotiating a steep rock surface with foot grips provided for safety. The railings are no longer available for support. While negotiating this patch maintain composure and avoid looking into the valley below. Be focussed on the foot grips. It takes exactly 5 mins to cross this patch. The third patch start after you reach the top. We need to cross 7 hill humps before reaching the magnificent rock carved Harishchandrareshwar temple. One needs a cap and glares handy for walking through the hill humps as there a very less trees providing shade. via Pachnai – Pachnai can be accessed from taking a diversion on the Mumbai Nasik highway at Ghoti. The road leads to Rajur in Ahmednagar district. From Rajur take a trax or bus to Pachnai. The climb from Pachnai is shorter compared to Khireshwar as it takes you straight to the Harishchandreshwar temple. However the climb is steeper as the altitude is covered quickly. A guide is available at the village if required. via Belpada – the route known a Nalichi Vat is strictly for rock climbers carrying the required gear. Belpada can be reached from Kalyan via Malshej ghat near Flamingo resort. Grips are provided for rock climbers. Carry atleast 3 to 4 litres of water per person. There are 2 prominent caves which can accomodate 50 persons each. One cave is within the temple enclosure while the other cave called Ganesh guha is just below the hill behind the temple. Avid trekkers carry their tents, sleeping bags and mattresses along. A must do thing after reaching the top is to watch a breathtaking sunset from Konkan Kada cliff. This cliff is concave at its topmost end. The entire Malshej ghat expanse is visible from this cliff. Jivdhan and Naneghat are spotted at a distance. During summer rappelling is conducted from this cliff. The cliff is around 20 mins walk from the temple. Besides the temple there is a small pond called Saptatirtha. Trekkers normally bath around this pond. The pond water is not portable. A short walk from the temple towards the Pachnai side takes you to the Kedareshwar cave. In here we spot a 5ft tall shivling surrounded by water. The water is cold and waist deep. 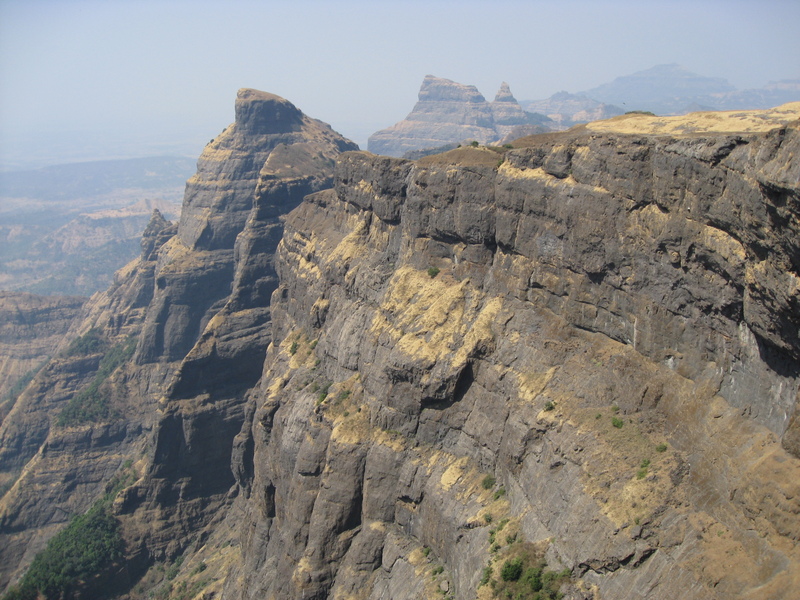 In case time permits one can visit the Taramati peak which is the topmost point. Campfire is a common activity on the fort during winter i.e November to February. On a moonlit night the campfire add magic to the ambience on the fort. Avoid trekking during Mahashivratri as there is a village fair on top of the fort. The cellphone signal is virtually zero of all networks. Duration : Around 7 hours from Khireshwar and 3 hours from Pachnai. For Mumbaikars the Khireshwar route is advisable. Avaiolability of food / water : During winter and summer the local villagers set up dhaba like stalls on the plateau around the temple oln weekends. They cook meals and provide tents on hire. Drinking water is availabe in a cistern in the temple cave. During the descent villagers sell lime water at select patches on the way to the top from the Tolar khind route. Essential : Cap, ample water and glares are a must. Overnight wear is required for camping.